Josephine Mandamin: To trust wholeheartedly, is to live life to the fullest and without question. Events happen as they will and all we need to do is follow our instincts. Such is Free Will. Things happen for a reason. The Web Page was getting to me. No one wanted to do it, especially for free. Then an angel named Jeanette came into the office one day and started talking all about Web Paging. With her crew, she came up with a design! We talked about the route around Lake Michigan starting at Escanaba/Hannaville and finishing there in June. She said she would map out the route and set up the mileage in between cities. Our Grand Chief Eddie Benton Banai called one evening and shared a bit of his troubled dream about the Water Walkers going through Chicago, Illinois. At our next meeting, we delved into the dream some more. We talked about the Mide ancestors who journeyed from Walpole Island to Grand Traverse, Michigan and how they left drawings along their route. When the Spirit moves, the gut feeling kicks in, in my case. I knew this was the way. I needed to talk to the other Walkers first, for their blessing. They agreed. My next task was to let Jeanette know as she was working so hard on setting up the Web site and mapping the route. I told her the change of events. There was a long pause… She said something happened to her as I was telling her the story of the change. Apparently, as she was attempting to map the mileage around Chicago; at the city before Chicago was where her computer stopped. It would not allow her to go through Chicago. She called one of her partners/helpers, and he also could not make the computer go through Chicago. They left it at that. We summed up the events as “miraculous” or “the Spirit works in mysterious ways”, even with computers! We are currently buzzing with making lists of ‘what not to forget’. Socks have to be bought. I already bought bandages for blisters, set aside some gas money, and made sure the Flag is ready and I keep looking at the Copper Water pail. It sprung a leak last year and we used Duct tape during the last leg of the journey. Mario is getting himself all worked up there in southern Ontario. He even bought a new pair of shoes! Violet is busy packing and downing her medicine drinks. She will arrive her in Thunder Bay on Wednesday, April 28th. Melvina is wishing her employer would hurry about her request for time off. This time we know what not to bring. 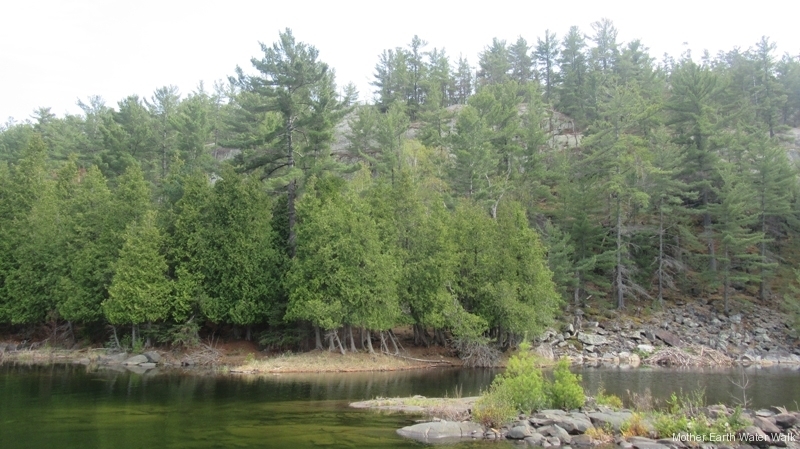 On Saturday, May 1, 2004, we will cross the ferry at Wallaceburgh, Ontario to the U.S. side. We will proceed north towards Port Huron, and from there we turn left on the road beside Hwy 69. Violet and I will pick up some Lake Michigan water on our way to Walpole Island on Friday. We understand there is a feast waiting in southern Ontario and there are ceremonies happening at the Chippewa of the Thames. As our ancestors walked, so shall we walk. Indeed we walked the path of our relations as we journeyed from Walpole Island, Ontario to Hannaville Potawami Nation in Michigan. 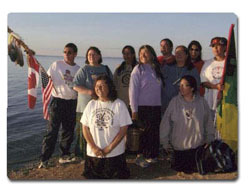 A send-off Feast was prepared by supporters from Walpole Island on Saturday, May 1, 2004. 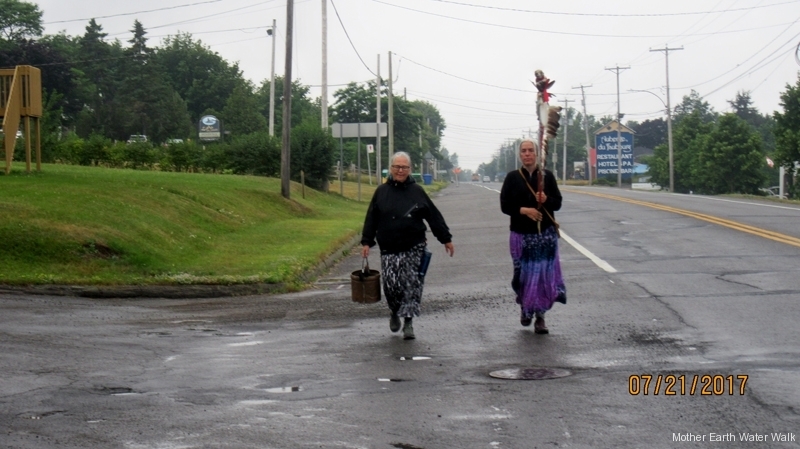 After the celebration and prayers, the community supporters walked the five miles to the ferry behind the Eagle Staff and Water Pail. Some supporters crossed the ferry on the St. Clair River to the Michigan side and walked along the river until sundown. The brave walkers who weathered the rain were: Nick and Mary Deleary, Waussay and her mother April, Carol Hopkins, Irene Peters, Mike (Saube), Marie Eshkabok-Trudeau and Stephanie, Joanne Keejick and son, and Mark Bruder and others. The next day, after having dried up and rested from the day before, we walked to Port Huron and from there we all took a ride to Bad Axe, Michigan to the Rock Drawings. After gaining entry to the Rock, our tobacco was offered, pipe smoked and watered the Rock. We marvelled at the teachings on the rock. Each of us in our own way, stood in utter silence for a long time, in admiration, pride and some with sadness at the greatness of what our ancestors left for us. This was a stark reminder for us that what we have been following in the Mide teachings is what has been taught from time immemorial. These drawings have been left for a reason and we began to know the reason. This visit confirmed and solidified much of our beliefs, teachings and our Way of Life. We have always known that our Mide Path is the true and natural way of the Anishnabe. We know that our teachings have always been this way and nothing is made up along the way; as some non-believers are inclined to believe. True to the prophesy, we continued our walk with the pail of water and staff at Port Huron. As we parted from our supporters, there were mixed emotions. Most emotional was the Lodge Song that we were sent off with. As we sang, we felt the Lodge suspended above us. That sound stayed with us for a long, long time as we walked the rest of the day. Animals came out of their way to greet us knowing we were there for a reason. In their uncanny instincts they came forward and bade us their greetings: – horses came galloping to meet us, chipmunks came in droves to see us, dogs came and lifted their paws to reach out to us, and of course, the birds that sang for us and with us; the wind-whispers and trees beckoning their acknowledgement of our walk and the waters shimmering their blessings on us. At this point it seemed that only the animals and nature knew that we were walking for the water. Onward to Lapeer, Davidson, Clio, Montrose and Chesaning. The traffic was light. We came upon these small towns without fanfare. Quiet, sleepy towns, we called them. This Walk was uneventful, other than the greetings from the animals, even buffalo, who acknowledged the walkers as if knowing who we were and what we were doing. Totally awesome! At Chesaning, Michigan, we came upon a famous big stone, in the centre of town. It was evening when we were directed to the sight. The rock had many moulded designs of animals that we could make out especially our clans: fish, eagle, otter, bear face and turtle. Mark had found us at this time, much to our surprise and celebration. We feasted in our own way; from a brown paper bag full of groceries. At this point we had to dig deeper into our pockets for essentials. We were now a group of seven: Patty Shawno, Irene Peters, Mario Wassaygesic, Violet Caibaiosai, Melvina Flamand, yours truly, Josephine and our PR man, Mark Bruder. We went to sleep with comfort and peace knowing we are being cared for. Before daybreak, the next day we were up to visit the Grandfather Rock we saw the day before. Imagine our ancestors coming upon this sight? Out of nowhere, this Rock came to be! Did it fall out of the sky? There was no evidence of any other rocks anywhere. The terrain was even and tree laden. As we stood in the darkness, water pail and staff in hand, we held our tobacco and prayed for all creations, elements, energies and to our ancestors. Immediately, we felt the presence of something around us. One of the walkers saw three shadows on the other side of the rock. We knew we were being watched over. We offered water from the pail to the great Grandfather and touched the imprints for the last time. We exited afraid to look back because it was like leaving a loved one behind. From Chesaning, we followed Hwy 57 to Ithaca on Hwy 27. Mark had already left us to do his work. We stopped at a park in Alma to map out our destination and determine where to sleep for the night. We made connections with Mark and supporters from Mt. Pleasant. They came and helped us with our journey and accommodations. Angel told us we could sleep at her house. We Smoked the pipe near a monument close to Sheppard, Michigan; and waited – for someone to take us into Mt. Pleasant and Angel’s place. There was a Sweat waiting for us and Mide visitors from other directions. We rested for the night and woke early the next day to take up our Walk from where we left off the day before. The Tribe of Mt. Pleasant joined our walk into the village along with escorts by the tribal police as we were led by their Chief Audrey. There was a feast at the Community Learning Centre, where we were presented with a ‘three eagle feather flag’ placement which was added to our Eagle Staff forthwith. An evening gathering was led by the Mide women of the community with the Water Ceremony, teachings and sharing of the Walk by the grandmothers. The next few days we rested, visited sights, museum and meetings. Especially outstanding was the Historical Museum which we were allowed to view prior to its grand opening. To be in that Museum was to be in a world of our ancestors and yet we walked on the same path that they travelled. What a transformation. We were in a museum with them. The stories, sounds, feelings, thoughts were too much to bear. I had to find a quiet space to be within my thoughts. I marvelled at the eeriness of their presence, of their truth, their love for nature, and caring for all things. I was filled to the brim with pride in my ancestors at what they have left for us; – a legacy of who we are. What more can we say about ourselves as the true Anishnabe of this part of the earth. I could not help but look at what the white nations have left for their future generations; destruction, pollution, oil spills on the water, violence and greed. I stood with my head high. The overwhelmingly sincere hospitality of this community brought to mind how our ancestors must have welcomed their white visitors who came to know them, and how our people must have greeted, feasted, made welcome, in much the same way, we felt welcomed.. We felt so welcome and we did overstay our welcome. We were set up at the famous Soaring Eagle Casino. Onward to the shores of Lake Michigan, walking beside the sandy shores, and viewing the beauty that cameras cannot capture was such a treasure for us. Then on to Peshabestown, Sweat, and resting the Walkers at the home of Bebamikwe and Dee. Onward we walked the final day to the canoes waiting to take us across to the peninsula and Petosky. The canoe trip was a journey never to be forgotten. At Atwood we ended our walk for the day and stayed in Victories Casino. Massages were available to those who felt okay to have their bodies worked on. For me I’m too old fashioned to allow one to touch my body. Like my spirit, I hold sacred. Again, as in Mt. Pleasant, we were treated like royalty. We were made to feel honored in every way possible, with speeches, plaques, certificates, media interviews, and in turn we shared our WaterWalk purpose to the people. We shared with the teachings of the women’s special gifts and water’s connection with women and the moon. 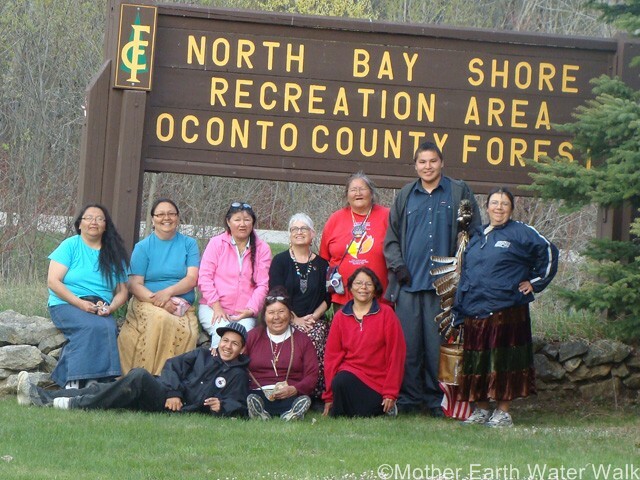 The sharing was well received especially by the Grandmothers who could relate to the teachings handed down to them from their own grandmothers. It was such a treasure to know this and that these teachings are still remembered to this day. One local brother took us to the sacred Council of Trees. We offered tobacco to each tree and as I approached the third tree, it wanted some water. I proceeded to wash each tree with the water in the copper pail. As I got to the sixth tree it started to cry and water was running down from its side. We stood and cried with it. We knew that no visitors have ever came to show them respect, and we knew, that we would return under different circumstances. At least they had the company of each other but no human knew to come and listen for them to share their great wisdom, visions, and prophesies. We reassured them that we would return someday, soon. The leaving of this community was so historic, in that we were left with a song from the Chief Frank Ettawageshik and so many people walked as far as they could on the last day. From Harbour springs we walked on to Cross Village. Another stopping point of the ancestoral journey. Tales of canoes lining the shores of Lake Michigan in greeting the light skinned races were talked about by the local walkers. All these stories bring joy and pride in our ancestors’s strength, unity, patience, and especially the beauty of innocence and blind trust in all things. They welcomed the light-skinned race and took care of them. The cross symbolized two distinct meanings: one meaning as understood by the light-skinned race and one meaning of our ancestors. Was this why we were led astray? These thoughts move one into many questions. The walk ended for me here because I had to return to Thunder Bay; May 20, 2004, on an urgent matter. The group made it across the Mackinaw Bridge with other local members; Goldie and Peter and others. The following days journeyed on to Escanaba. 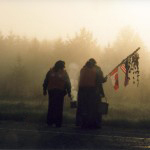 I met up with them between Hannaville and Escanaba to complete the journey. The completion of the journey was with mixed feelings of happiness and sadness. Parting is never a happy moment, but there were a lot of feelings of ‘a journey to remember’, and respect to the Elders and Grandmothers who made it to the finish line, especially our Grandmother in her wheelchair. I can understand where the phrase comes from ‘parting is such sweet sorrow’. We feasted in the Centre and all participants shared their feelings about the Walk and the Water. 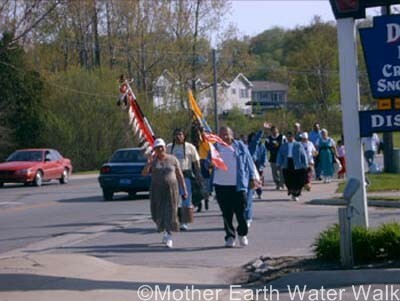 We all quietly journeyed home to our own communities anticipating what the next WaterWalk will be like. Megwetch and see you all next year.